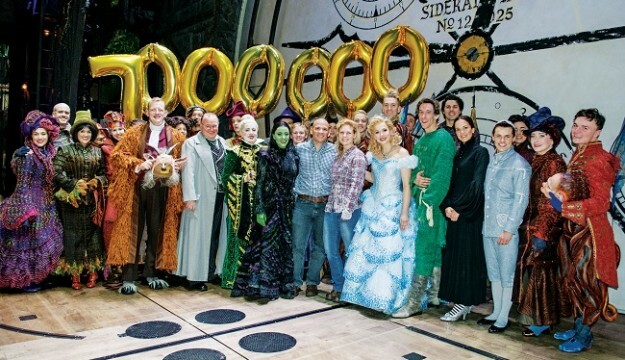 WICKED, the classic West End musical that tells the incredible untold story of the Witches of Oz, welcomed its 7 millionth theatregoer to London’s Apollo Victoria Theatre at the matinee performance on Saturday 17 October 2015. Andrew Bell attended the performance with his wife Katie Bell and enjoyed a back stage visit with the cast after the performance. Acclaimed as “one of the greatest musicals of our time” (Daily Mail) and “one of the West End’s best-loved shows” (OfficialLondonTheatre.com), Wicked is now in its 10th year and was recently named London’s No.1 Long-Running Show by BritishTheatre.com, awarded a Certificate of Excellence by Trip Advisor®, is the first ever UK stage production to receive coveted Reader Recommendations from Good Housekeeping and Cosmopolitan magazines and won the coveted 2015 Olivier Audience Award. Around the world, Wicked has been seen by nearly 50 million people in 13 countries and won over 100 international awards. The original Broadway production remains “Broadway’s biggest blockbuster” (The New York Times) after 12 years at the Gershwin Theatre. Wicked stars: Emma Hatton (Elphaba), Savannah Stevenson (Glinda), Oliver Savile (Fiyero), Liza Sadovy (Madame Morrible), Tom McGowan (The Wizard), Sean Kearns (Doctor Dillamond), Daniel Hope (Boq), Katie Rowley Jones (Nessarose), Natalie Andreou (Standby for Elphaba) and Carina Gillespie (Standby for Glinda). Based on the international best-selling novel by Gregory Maguire that ingeniously re-imagined the stories and characters created by L. Frank Baum in ‘The Wonderful Wizard of Oz’, Wicked tells the incredible untold story of an unlikely but profound friendship between two sorcery students. Their extraordinary adventures in Oz will ultimately see them fulfil their destinies as Glinda The Good and the Wicked Witch of the West. Wicked has music and lyrics by multi Grammy and Academy Award-winner Stephen Schwartz, a book by Winnie Holzman, musical staging by Wayne Cilento and is directed by two-time Tony Award-winner and Olivier Award nominee Joe Mantello. Wicked is based on the novel ‘Wicked: The Life and Times of the Wicked Witch of the West’ by Gregory Maguire. Wicked is produced by: Marc Platt, Universal Stage Productions, The Araca Group, Jon B. Platt and David Stone. Executive Producer (UK): Michael McCabe.